Can the spiritual successor to an 80s budget classic can live up to its predecessor? A good guitar with some potentially frustrating flaws. Make sure to try out some competitors as well. Solid feature set and pleasing tones. Frustrating finishing issues and a high initial string action spoil the fun. Guitar players of the, ahem, more mature variety may well be experiencing a serious case of déjà vu when they first set their eyes upon the Seagull Coastline Momentum A/E HG (let’s just call this the Momentum from here on, eh?). That’s because this rather smart-looking budget electro bears more than a passing resemblance to the classic Seagull S6, first introduced in 1982 and the staple of many an up-and-coming six-stringer from that generation. The new Momentum looks to continue this legacy by leading the way forward with a smart, feature-rich package that on paper looks to be a particularly versatile little package for players on a budget. There’s no question that the upper end of the budget market is a hotly contested niche right now, so it remains to be seen if Seagull can use its experiences from the S6 to set the bar once again. As with all of Seagull’s guitars, the Momentum is not built in some far-flung factory as part of a cost-cutting exercise. Rather, it is manufactured in the village of La Patrie in Quebec, Canada - a good sign from the off. A first inspection of the Momentum reveals a tidy build with a few very nice touches that are indicative of the extra level of care that Seagull has paid to the guitar’s construction. Much like the S6 before it, the Momentum features a solid cedar top with a laminated wild cherry back and sides. However, unlike the S6, where the cherry was left untinted to fully show off the striking grain and colour of the tonewood, for the Momentum the back and sides have been stained a dark, reddish hue. This is of course a purely subjective matter, but for us it looks a little cheap and takes away slightly from the overall aesthetic. There’s no denying however that the cedar top looks very attractive indeed and appears to be of a very good quality. The strip binding and herringbone rosette are also very tastefully chosen and well applied for the most part, save for a gap in the binding at the very top where the neck joins the body. The body is then finished in gloss, which again is very well applied. We were particularly impressed by the fact that the Silver Leaf maple set neck contrasts the body by having a satin finish, and has been joined in such a way that there is absolutely no buildup around the area where it meets the body. Moving over to the neck, everything is pretty much as you would expect; a rosewood fingerboard decorated by a set of simple dot markers on its way up towards Seagull’s distinctive headstock, which is shaped so as to offer a straighter string pull, intended to result in greater tuning stability and intonation. The only negative mark to mention is an all-too-familiar bugbear in guitars in this price range - scratchy frets. It’s something that few budget guitars manage to get right, but in our opinion it’s needed in order to stand out from the crowd more often than not. So to see this neglected here isn’t a surprise exactly, but a disappointment nonetheless. The neck itself is reasonably wide at 1.8”. While the intonation is pretty much spot on, the action has been set quite high, which could potentially be a turn-off for some players. Elsewhere on the guitar, a quick peek under the soundhole reveals a very tidy internal construction, with the spruce bracing very neatly carved - no blobs of glue or splintered fragments of wood to be found. The nut and saddle are both constructed from Tusq, while the tuners are Seagull’s own ‘High Ratio’ design, which seem to tune accurately and smoothly. 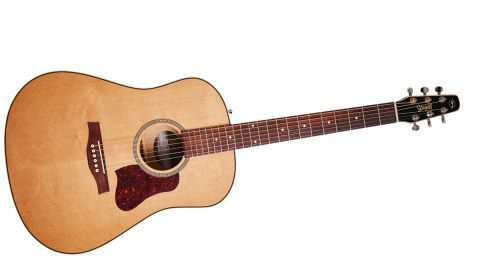 The guitar also comes equipped with two strap buttons, which partnered with the onboard Fishman Sonitone preamp, lets you know that the Momentum is a guitar that definitely wants to be gigged. The Sonitone is a well-regarded system, despite its budget-friendly leanings, and offers a fuss-free solution for players that want to take their sounds to the stage and don’t mind sacrificing the on-board tuner or other extras included on other units. There’s rarely any better way to test out a budget guitar than by letting a few open chords ring out, and the Momentum immediately makes a good impression in that regard. There’s a good level of sustain and harmonics to the notes as they ring out, remaining balanced from the low notes through the highs and enjoying excellent projection thanks to the well-constructed Adirondack spruce bracing that sits hidden under the cedar top. Shifting from open chords to more complex shapes further up the fingerboard continues this nicely, with the upper registers remaining clear and well intonated. The cherry back and sides might be laminated but they still make their mark on the tone, with the spectrum sitting somewhere between mahogany and rosewood for a nice punchy tone that still has plenty of depth and sparkle, whilst not getting overpowered to become shrill, muddy or boomy. We found that the Momentum sounded best when strummed further back from the neck, slightly behind the soundhole. If you’re the kind of player that naturally gravitates towards the neck (we’ll admit it - we do this quite a bit) you’ll need to adjust your playing technique ever so slightly, otherwise the notes do become a little muddied and muffled if you’re not careful. Plugging into an amplifier, the clean, unaltered signal from the Fishman Sonitone provides a very workable and versatile tone for the money. It’s very natural and easily shaped, reacting well to pedals and sounding nicely rich when introduced to a touch of reverb in particular. The controls under the soundhole don’t do a great deal of tone shaping, so once you find the sweet spot we’d say you’re probably likely to leave the controls as they are and spend the rest of your time tweaking your amp and/or effects instead. All in all it’s a little bit of a mixed bag from the Momentum. There are some wonderful touches in the construction, such as the quality of the internal woodwork, the quality of the cedar top and the impeccably constructed bracing. It’s got a decent set of tones as well, with the electro tones impressing and the acoustic performance rewarding once you find the right placing position to get the balance right across the strings. However, there are some frustrating drawbacks which stop the guitar from taking a place at the top of the budget guitar rankings. The quality of the frets is a little disappointing, so too the little inconsistencies in the finishing and high string action. These could be forgiven if the guitar was priced at £350-400 but at £500 you hope for something a little greater, particularly if you’re dealing with a laminate back and sides, when there are guitars in the same price range offering solid construction throughout. It’s entirely possible that some (or even all) of these niggles we’ve picked out won’t matter a jot to you, and we’d still absolutely encourage any guitarist to give the Momentum a test run. But it’s not enough to earn an out-and-out recommendation and for that reason we’d suggest having a few options in mind when you go out to shop for your next guitar.